I’m not usually very successful when it comes to baking sweets. My cakes often turn out flat, under or over baked. My baking talents are limited to cookies, muffins, crisps and the occasional pie. But fortunately this dessert requires no baking at all! I guess that’s why it was a huge success. I wanted to make some type of dessert for my husband’s birthday and I was contemplating a tiramisu (another one that requires no baking and that I can make well), a key lime pie or a crêpe cake. I first attempted a crêpe cake this past winter which turned out a little dry and I’ve been meaning to try again. So this key lime mascarpone crêpe cake was a combination of the three desserts I was considering. perfectly on a basic round dinner plate which I used to layer the cake on. 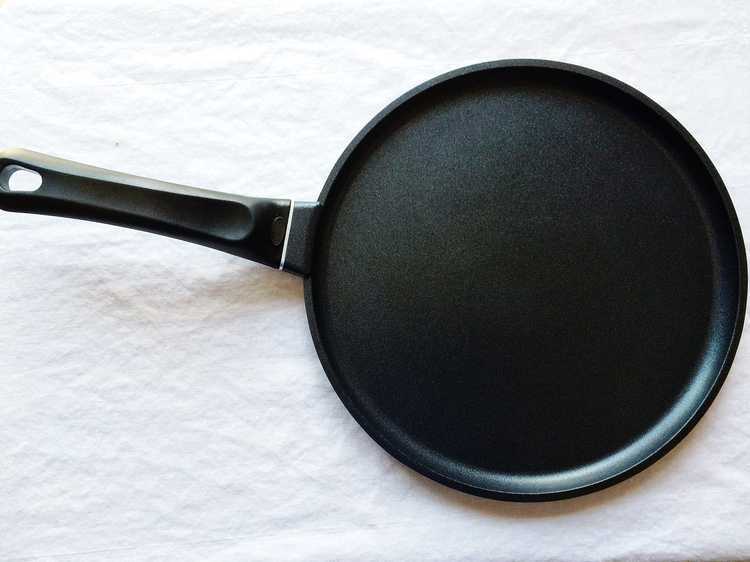 If your crêpe pan is smaller you’ll have a cake with a smaller diameter but more height. This cake is not very high but with all those layers of cream, I felt it was rich enough. I made a batch of crêpes based on the recipe I usually use for savory crêpes but I modified it by adding some sugar and melted butter instead of oil. I made the crêpes a day ahead of time and put them in the fridge until ready to use. If you make them on the same day make sure they cool completely otherwise when you add the cream they’ll slip and slide. I then set out to make a typical mascarpone, egg and sugar mixture you would normally use for a tiramisu and I added key lime juice and grated lime rind. As mentioned in my “Food Finds in South Florida” post, I bring back bottled key lime juice from my trips to Florida. I’m not sure if key lime juice is available in Montreal, but if anyone knows where it can be found do let me know. If you don’t have key lime juice I would substitute lime juice instead. Next I added some whipped cream to the mascarpone mixture to make it a bit fluffier. And that’s all there is to it. 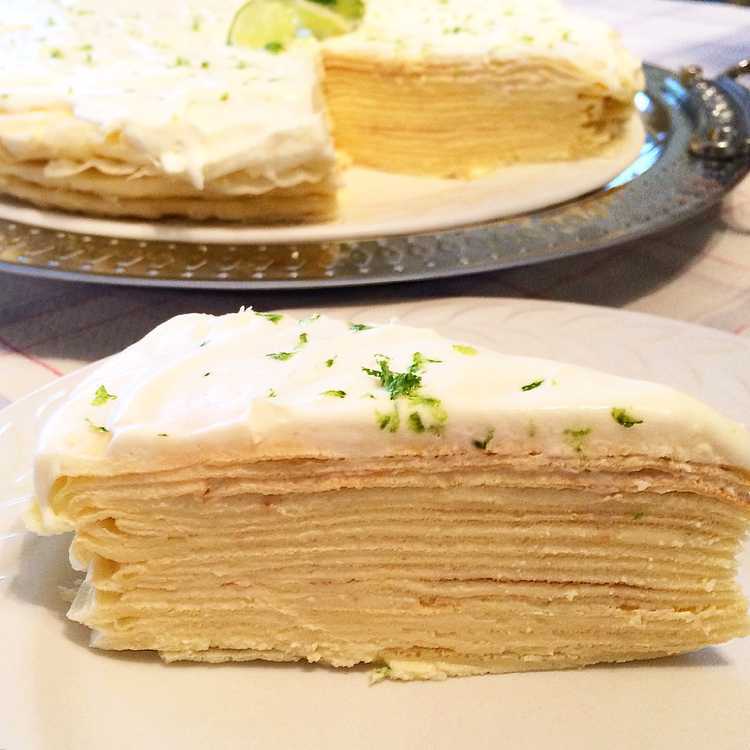 Just layer crêpes, key lime mascarpone cream and top with a thin layer (or thick if you prefer!) of whipped cream. I recommend that you assemble the cake 1 day before serving in order for it to set or at least in the morning if you intend to serve it for dinner. And there you have it, a simple, elegant dessert perfect for summer days! . This rich dessert is an elegant yet simple cake that requires no baking at all. Simply layer crêpes with a creamy, lime scented mascarpone cream. In a large bowl beat the eggs, add the melted butter, salt, sugar and flour. Add the milk/water combination and blend until smooth either by hand or with an immersion blender making sure there are no lumps remaining. Set the batter aside to rest for at least 1/2 hour. The batter must be thinner than a typical pancake batter. If necessary add some milk or water to thin it out. During this time you can prepare the cream, if you wish. 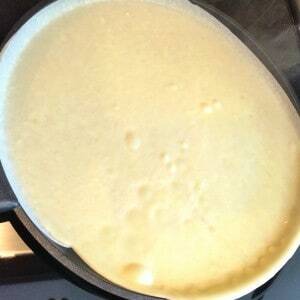 Heat a crêpe pan and brush with a little melted butter. Pour in a ladle full of batter, swirl the batter around by tilting the pan making sure that the batter completely covers it and flip the pan over the bowl with the batter in order for the excess batter to pour out. Cook for a minute until golden, flip the crêpe over and cook on the other side a few seconds until lightly browned. 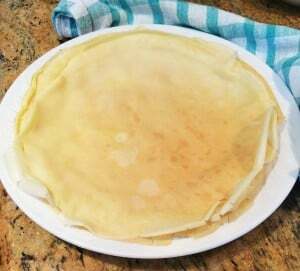 Stack the crêpes on a plate and cover with a cloth until ready to fill. Or at this point you may cover the crêpes with plastic wrap and place in the refrigerator. The crêpes will not stick together. Continue to cook the crêpes adding some melted butter to the pan as needed. 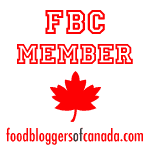 Bring about 1 inch of water to a boil in a small sauce pan. In a bowl small enough to fit over the saucepan, add the egg yolks and the sugar. Place the bowl over the saucepan, making sure the bottom of the bowl does not touch the water, and whisk the egg yolks and sugar until the mixture is smooth and forms ribbons when you lift the whisk. Allow to cool. Meanwhile, beat the egg whites until peaks form. In a large bowl, combine the egg yolk mixture and the mascarpone. Gently fold in the egg whites until incorporated. Stir in the key lime or lime juice and grated lime rind. Whip 3/4 cup of the whipping cream until soft peaks form and stir into the mascarpone mixture. 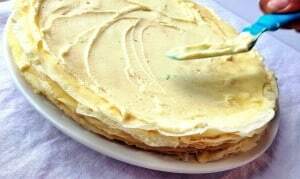 Place a crêpe on a plate and top with approximately 1/4 cup of key lime mascarpone cream. Spread evenly with an offset spatula. Continue to layer crêpes and cream and top the final layer with the remaining whipped cream. Grate some lime rind over the whipped cream. Refrigerate for several hours before serving. 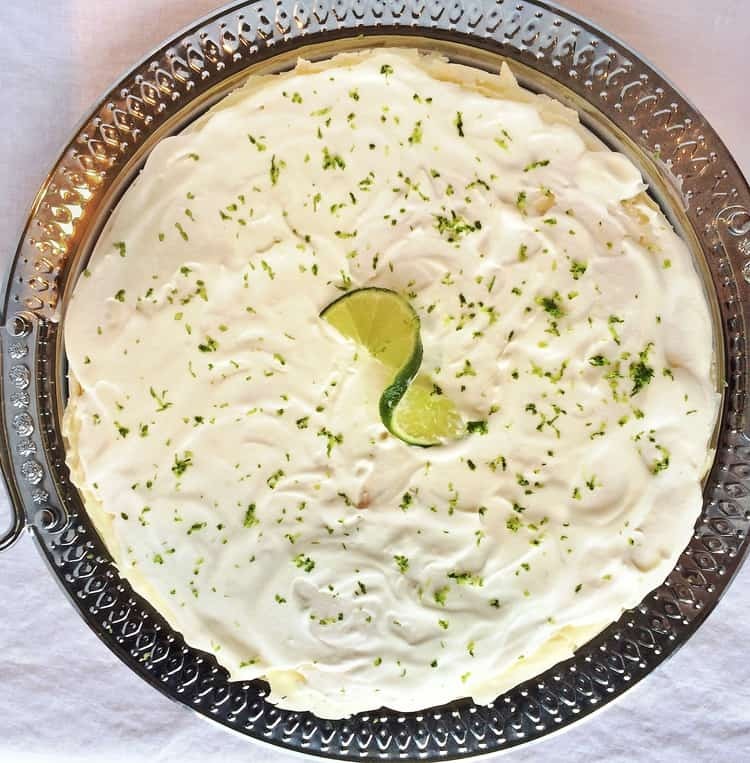 I had a friend request a crepe cake for her birthday and she said her favorite pie is Key Lime. I've made crepe cakes before, but this was the best. Everyone went back for seconds. Thanks so much! Hi Brad, that’s wonderful! I’m so glad everyone enjoyed it and thank you very much for your feedback, it is truly appreciated!